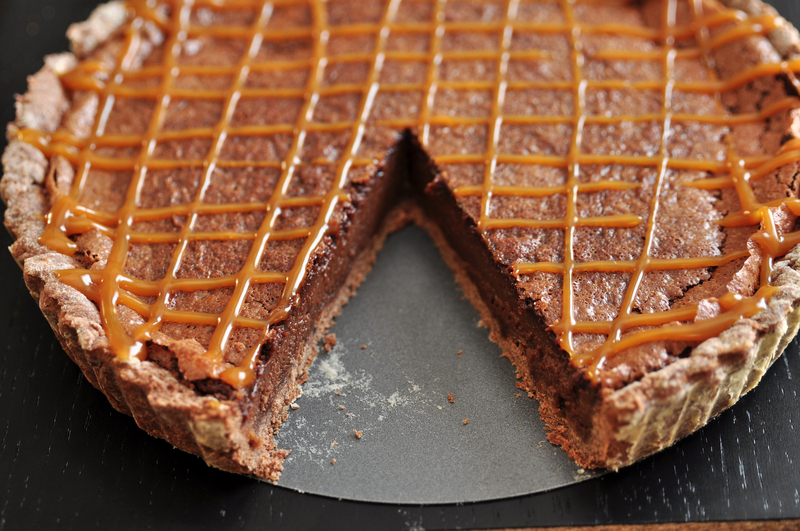 Any Chocoholic Worth Their Salt(ed Caramel) Will Go Crazy For This Tart! 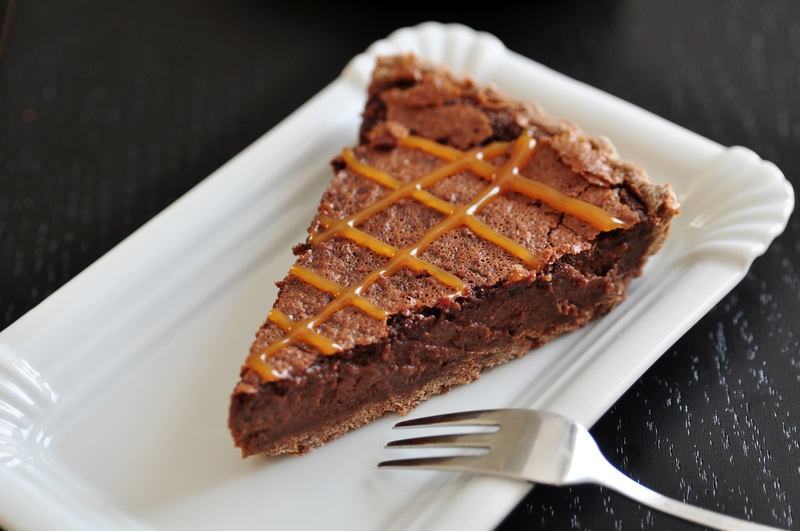 While we frequently go for “comfort food”-type desserts, every once in awhile we like to take it down a notch and whip something up that’s elegant and refined…to us, it doesn’t get better than this amazing caramel chocolate tart. Sinfully rich, without being over the top, this is a dessert that will stun your guests and have them coming back for (so much) more; the presentation is beautiful and the flavor doesn’t disappoint – seriously, it’s a show stopping dish that you’ll be thrilled you made! Combine flour, sugar and salt in the bowl of a food processor and pulse together. Add cold, cubed butter and pulse until mixture resembles small pebbles. Turn mixture out in a fluted pie pan and use your hands to press it into the bottom and sides of dish. Refrigerate crust for 20 minutes, or until chilled, then use a fork to prick holes in the bottom and place in oven. Bake shell for 20-22 minutes, or until golden brown, then remove from oven and set aside. Lower oven temperature to 325º F.
Combine heavy cream and milk in a large saucepan over medium-low heat for 5-10 minutes, or until bubbles start appearing around the edges. Add in chopped chocolate and whisk until melted and smooth, then (while continuing to whisk vigorously) mix in eggs, vanilla and sea salt. Once mixture is completely combined, pour into cooled pie shell and bake for 17-20 minutes, or until center is just set. Remove from oven if surface starts to bubble or crack. Let tart cool before drizzling generously with caramel sauce, then serve and enjoy!